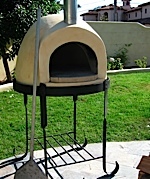 We handle The Finest Line of Imported Wood Fired Pizza Ovens, Gas and Wood/Gas Fired Ovens. We have install kits, steel bases and a complete line of Refractory Products as well as geting your oven to you and Installed for you. line We have Installed these ovens all over the US, In backyards, houses and resturants along with our Mobile Trailers and Catering units. Below are some Photo's click on the links Below to learn more. When you are ready to order or need help with oven choice or other questions contact the Pizzaman. We ship and or come to you anywhere in the US. Alsey Refractories Company has been manufacturing first quaility products for over 100 years. Their products are commonly used in OEM Wood Fired Oven units as well as Custom Site Built Ovens. Check out this site, lots of info on building your own oven from native materials. 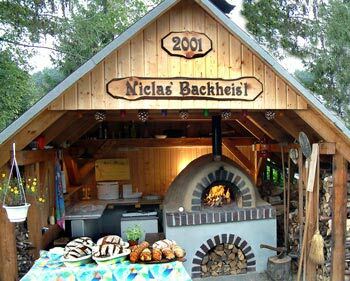 He built the Pizza oven in 2001,The small baking house carries the name of his Son. He built the oven using completly natural materials. Check it Out! Pizzamanmike has just added a line of custom welded Steel bases. The bases will fit all Imported and Home built ovens, They can be shipped complete or knocked down an assembled on site. That comes in handy when installing inside as most doors are only 36" wide. The front face has an arch built in already for you wood storage, all exterior finshes can be added to frame. Simply screw on some 1/4" hardi backer and away you go. I can also add the hardi backer for you. If the sizes below are not right for your project, let me know and I am sure I can get you what you need. *Note larger base's should ship knocked down, but can be shipped complete. All bases ship in 3 to 4 days after order is recieved. Or give us a call at (928) 768-7744. We are just about ready for you Home Oven Builders. The list Below is what I came up with for you Home Built Oven Projects. The extra Firebricks can be used for your arch and can be stained to change color. The castable refractory is for a sub base on oven deck and you can set and level your oven floor in this base. The rest of the castable is to be add to your dome exterior. You can fill all voids and build up a the dome with this. It is rated to 3000 degrees. Pizzaman Mike Says "check out some of our suppliers" we will include more links related to our business or that we think will interest you,our customers. We may also provide links to other interesting shops you may want to visit.